In my opinion, one’s pillow can make or break a good night’s sleep. I prefer a fairly flat pillow, filled with genuine down, that I can fluff exactly the way I want my head and neck to be supported. Unfortunately, most hotels these days provide enormous pillows that prop me up so high I feel like I’m ready for breakfast in bed at any moment. Years ago when I was suffering from backaches, a healthcare professional suggested that I try sleeping with a small pillow between my knees. It works. 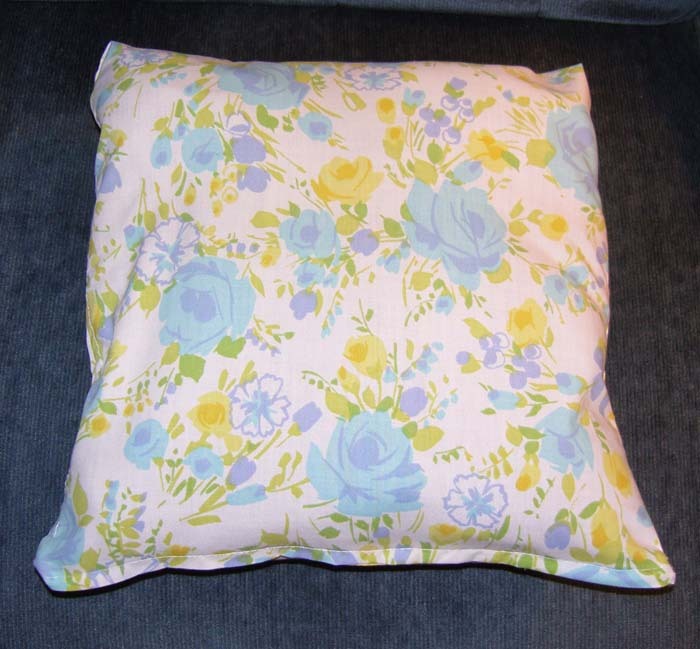 However, when I pack for a trip using a carryon only, there’s no room to bring along my knee-pillow. I’ve tried using one of the enormous hotel pillows between my knees, but every time I roll over, the obstruction tangles in the sheets and wakes me up. 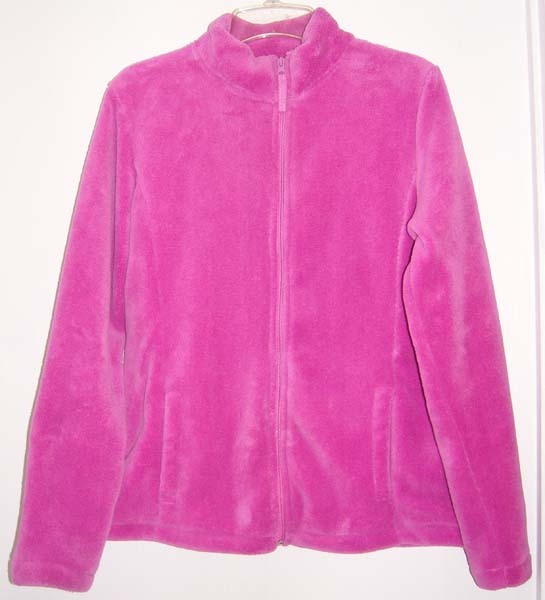 I have two plush jackets: one black and one radiant orchid. I was pondering the pillow problem recently while packing for a winter business trip. I like to include a comfy plush jacket to wear on the plane or have handy whenever extra warmth would be nice. As I started to fold up the jacket, it occurred to me that I could perhaps find a way to turn the jacket-by-day into a pillow-by-night. 1. I started by looking through my fabric bag for a piece of smooth, woven cotton. What I found was the undamaged part of a pillowcase that years ago had survived an accident with a red pen. The zipper lets me use the pillowcase as a packing cube while traveling and keeps the folded jacket from squeezing out when it’s serving as a pillow. 2. Then I folded the jacket into a something of a square, tucking in the sleeves and making sure the zipper was on the inside of the bundle. I measured the size of bag I would need to cover the folded jacket, and I cut the fabric remnant to the correct proportions. 3. I purchased a white zipper a little longer than needed (none were available in the exact length), marked the point where I wanted to shorten it, whipstiched the zipper coil to anchor it at the new length, and cut off the excess. 4. 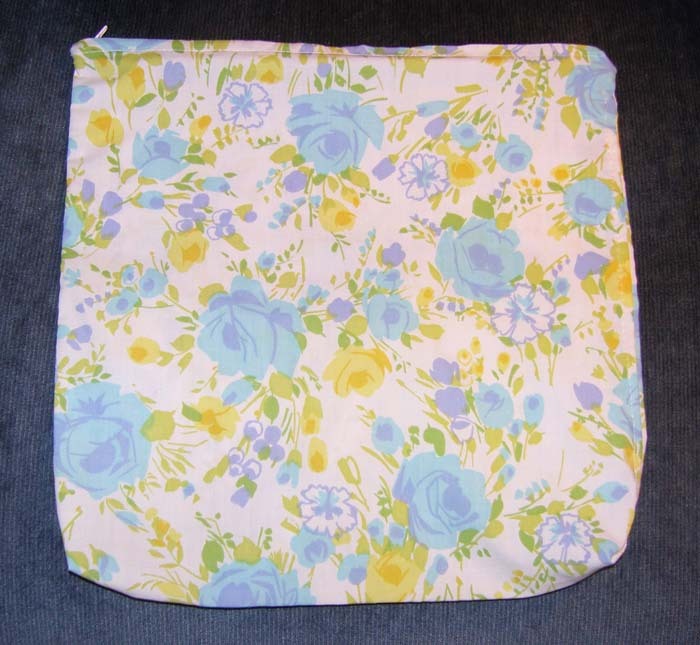 Next I stitched up the sides of the pillowcase and installed the zipper. The empty pillowcase takes up very little room in my carryon and sometimes even serves as a packing cube for pajamas or socks. Although any item of clothing could be pressed into service for pillow-stuffing, I’ve found plush fabric to have just the right amount of loft for my comfort. A down-filled vest or jacket could work too if you already wear either of those items on your journeys. A “wearable” pillow provides comfort on any trip without adding extra bulk or weight. My back is grateful I’ve discovered how to bring my knee pillow on trips. And when my head is lying on a hard or enormous pillow away from home, I’ve been known to swap the offending pillow for the small one between my knees. I figure waking myself up when I roll over during the night is better than getting no sleep at all. This entry was posted in Pennywise Packing Pointers and tagged airports, creative solutions, flying, jacket, luggage, packing, pillow, recycling, trash to treasure, travel, zipper. Bookmark the permalink.